Let’s fight for the right to make horrible mistakes, but remain in the realm of the living. 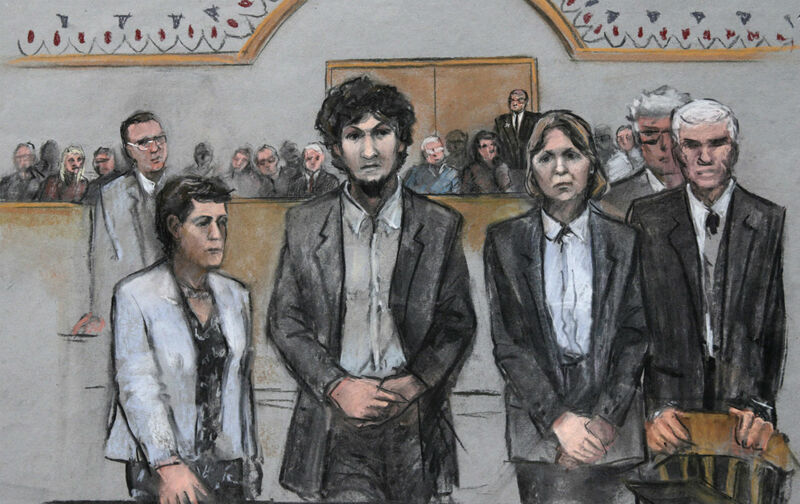 In the days when Boston Marathon bomber Dzhokhar Tsarnaev’s jury was deliberating about whether to sentence him to life in prison or death, I thought often about members of his legal team who’d worked behind the scenes: the “mitigation specialists.” I’m a colleague of these people—I belong to a small group of journalists who supplement our income with freelance “mitigation” work. That means we do a special type of investigation for death-penalty cases. Our clients are accused and often, like Tsarnaev, already convicted. The prosecution paints them to the courtroom and press as monsters. Mitigation investigators try to de-monster the monsters. We do this mostly by talking to people who know our clients—by visiting their hometowns and even foreign homelands, their schools, churches, former workplaces, Alcoholics Anonymous meetings, and old Army buddies’ houses. For one case I went to five cities and two countries, and interviewed 80 people. We dig into an entire biography, starting from childhood. We search out hardship in early life. In death-penalty cases, this is usually like shooting into barrels of fish. Capital murder is an extreme behavioral outlier and almost always is associated with a gross inability to control one’s frustration, anger, and other antisocial impulses. The problem is most often associated with conditions like intellectual disability, mental illness, exposure to environmental and workplace toxins, and substance abuse. Learning this background can liberate a jury from simplistic and legalistic notions of “guilt,” toward the more complicated understanding that when terrible things happen to someone, even grotesquely violent responses are imbued with a quantum of moral innocence. Capital defense lawyers like to hire journalists. We flesh out clinical-sounding histories with real people talking about real things. We focus on narrative; we attend legal trainings that feature workshops about Aristotelian poetics. Not only do we unearth our clients’ childhood suffering, we also show how, like all humans, they tried to push back against those sufferings—tried to overcome. But they weren’t so lucky. Exposition. Rising action. A plot gone awry and a horrible climax. The denouement remains to be written. We mitigation specialists hope the poetics of our client’s life will move the jury to consider their own poetics. To think, as they lie in bed at night after court: “There but for the grace of God go I. Or my child!” They might vote to kill a monster, but not a human. Mitigation narratives don’t work all the time—witness what’s just happened with Tsarnaev. But they work often enough, and they save lives. As a result of this work, I see capital cases from the inside. I see privy things. Very occasionally, I see strong evidence that someone is actually innocent: they seem truly to have done no wrong. These cases underscore the State’s outsized and often corrupt power, exercised though egomaniacal and dishonest district attorneys, lying cops, inept “experts.” These cases have become a powerful argument against the death penalty. But I’ve also seen cases in which the defendant and his lawyers have publicly claimed innocence—yet during my work I’ve found evidence suggesting my client is guilty. I’ve seen attorneys hide the “bad facts” of the case—facts, kept quiet by the defense, which suggest that my client did commit murder. These are the moments in which I question the corrosive role that “innocence” plays in criminal justice, and in our effort to reform that broken system. Claims of innocence can be tremendously useful tools. In court they can rout a death sentence, particularly when raised on appeal to contest an execution that is imminent. Politically, innocence claims are a potent argument against capital punishment, because who, even among the most die-hard of capital punishment advocates, wants to mistakenly execute the blameless? But innocence claims, even in far lesser crimes than murder, can be as corrosive to our struggling comprehension of humanity as is the prosecutor’s rant about “monsters.” Handed down in courtrooms and in the court of public opinion, a judgment of innocence gives indigent people, people of color, and immigrants the right in America to live. But the other side of the shiny coin of innocence is the crumpled currency of guilt. You’re not innocent? You fucked up? Then you deserve your exile—prison for an eternity, ejection from the United States, your life injected away on a gurney. After all, you’re not innocent. Usually, my client readily admits guilt and feels terrible. Sometimes he (yes, most are men) wants to skip all the defense crap and just get convicted and die. It often falls on me to give the life pep talk. Beat the death penalty and you will be able to live in general population. You can make friends, remain in touch with your children. You can have a life behind bars. Not like outside, but still a life. Then I go out to find the story of that life. It will be highlighted in the second part of the capital trial: the sentencing phase, where punishment is assessed. By then, guilt will have been legally established. To give an example without invading anyone’s privacy, I offer a composite case with a fictional defendant, “Donald Penny.” Back when he was accused, Penny was in his 30s, a high-school dropout and unskilled, casual laborer. He used to work for Clifton Ainslee, an affluent, elderly widower, doing Ainslee’s yard work and cleaning his bathrooms. One Sunday morning Ainslee was found in his living room, knifed to death. The home was ransacked. A neighbor had earlier noticed a car driving around the place as though casing it. The neighbor jotted down the license plate. He saw the drivers’ face clearly, the passenger’s not so well. After he heard a scream he called 9-1-1. Police responded and found the body. The car’s owner, whom we’ll call Bobby Noland, was quickly arrested. The neighbor identified him in a lineup; the dead man’s engraved Rolex was found in Noland’s car. Noland told police it was his partner, Donald Penny, who did the knifing. Penny cooked up the robbery, Noland said. He wore a ski mask, but when he got into a tussle with Ainslee, the mask came off and Ainslee recognized him. Penny said he couldn’t risk leaving a witness. He knifed Ainslee, then collected valuables from places that only someone familiar with the home would know. When authorities arrested Penny they found no blood on him, none of Ainslee’s belongings, no knife, no mask. The neighbor couldn’t identify him in a lineup. Penny said he’d been in his own home, alone, during the murder. But he was put on trail for capital murder. The prosecutor put on the stand an expert who said that hairs in Penny’s shirt matched Ainslee’s hair. The victim’s grade school–aged grandchild, who’d been in another part of the house during the murder, said he saw Penny running through a room. The court-appointed defense lawyers worked for $14 an hour with almost no money for investigators. Penny was convicted and sentenced to death. That was in the 1990s. I got involved more than a decade later, shortly before Penny’s scheduled execution. A smart, passionate lawyer had taken the case pro bono and started re-investigating. He assigned me to do the mitigation work. One of the first people I spoke with was Penny’s older sister, a low-level bank manager who had lived her adult life in a different world from her brother. They’d started out in the same bleak place as children, with a severely alcoholic, bipolar mother whose abusive boyfriends drifted through the home (many beat the mother; one sexually abused the sister; another did the same to Donald). I did not write this down, but I did tell the attorney. That was the last I heard of it. The attorney discovered that, in the initial trial, the district attorney never gave Penny’s lawyers police notes indicating that the grandson said he was asleep during the murder and saw and heard nothing. Revelations also emerged from the Innocence Project and the FBI about the shaky science of hair matches like the one used to convict Penny. His lawyer filed a new habeas. Racing against the death clock, he told the press Penny was actually innocent—of course, saying nothing of what I’d found in my investigation. Anti–death penalty activists amplified the innocence claim: “He’s a peaceful, gentle man! He was minding his own business! He was railroaded!” Women from Germany and Holland wrote to Penny on death row. One flew in to visit. Death-penalty abolitionists arranged press conferences. Penny’s conviction was overturned. I was relieved for him, of course. I was also relieved in another case where bite-mark and shoe-print testimony, which had led to conviction, were later exposed as junk science—yet, beyond the purview of the public, the legal team’s privy evidence suggested at least a modicum of guilt. I’m proud to have been on defense teams that have uncovered the terrible lack of due process to which so many people—most of them poor, damaged, and disproportionately of color—are routinely subjected. I’m proud to have kept these people alive. Yet I’m troubled at how innocence gets fetishized in the work of criminal justice reform, and not just in the movement to end capital punishment. It has also become a fetish when young men of color, like Michael Brown, in Ferguson, are killed by police officers and by people (such as George Zimmerman) posturing as police. Inevitably, the first hue and cry from the victim’s family and community is about how innocent he was. Everyone loved him! He was attending school! He was a lamb! Then the police leak prior charges. Marijuana, minor assault, burglary, the little convenience-store clerk shoved around. What about those shop-lifted Tiparillos?! He was waving them around on the street! As though a young man of color acting badly is, as police officer Darren Wilson put it when describing Michael Brown, the act of “a demon.” Or, as prosecutors at capital trials love to say, a monster undeserving of life. Sometimes I think of a confession, bathed in tears flowing soundlessly from the nose of a man who was forced as a boy not to cry. I think of an old man with an engraved watch and knife wounds through his head. I think of a young grandson pushed to parse a loved one’s murder. And nowadays I think of America’s latest villain, the teenaged Chechen refugee in Boston, and of how his legal team gave him a life story full of moral innocence, yet a “death-qualified” jury remained unmoved. Why? Maybe chilling testimonies of suffering from the many bombing victims who survived counted for more than Tsarnaev’s suffering. Or maybe big brothers in America do not have the sway over little brothers that they have elsewhere. Was the immigrant Tsarnaev’s life too foreign for this country’s empathy? Who knows? All I know is that, amid the culture’s obsession with vengeance, even poetics don’t always work. Mitigation investigation, with its task of finding moral rather than legal blamelessness, is not the real answer, either. “Innocence” can seem so anodyne and babyish. It’s like a book in the preschooler section of Barnes & Noble: So simple as to sometimes seem deep, but shallow in the face of the awful and glorious world. Maybe it’s time to fight instead for a human right that is hardly recognized. It’s the right, including for the poor, the dark-skinned, and the immigrant, to make a mistake (even one as horrible and offensive as Tsernaev’s), yet remain among the humans of America. Committing a crime requires the payment of dues that, even when justly assessed, may be very dear. But payment should include the inalienable right to continue with one’s life story, one’s true and not always innocent story—with exile, torture, and execution banished from our complicated national biography.